We can taylor the design to suit your needs. The ideal situation is a full brick chimney breast for these types of fireplaces and usually this is the case as these fireplaces suit period houses perfectly. The size of fireplaces is generally on the larger size but we do supply many smaller designs where space is limited, normally no chimney lining is required but your site survey will always highlight any potential problems. Open style fireplaces like this are not the hottest or the most efficient. But if you wish to balance this type of design with heat and efficiency we can taylor the design to suit your needs. 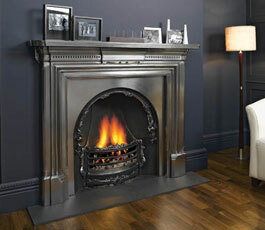 Fireplaces like this aren’t restricted to just coal or wood fires they are perfect for gas and electric installations. We can arrange Corgi and HETAS qualified installers qualified to carry out all of these installations.